SINGAPORE - A 37-year-old man, who died on Monday (Dec 19) in an accident on Ayer Rajah Expressway (AYE) that involved six vehicles, was cremated on Friday (Dec 23). 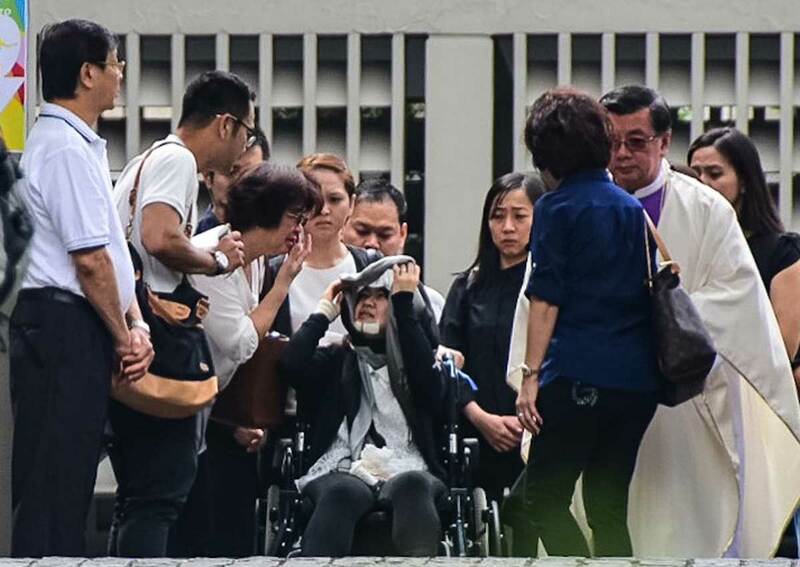 About 100 of his friends and family members attended the funeral service of Mr Jackie Liong Kuo Hwa at the Church of St Mary of the Angels in Bukit Batok on Friday morning. They included his parents and his wife, who was injured in the crash, reported Chinese daily Lianhe Wanbao. Ms Venny Oliver, also 37, was in a wheelchair, her head wrapped in a scarf. She and her husband were in a Toyota car travelling towards Tuas Checkpoint when a silver Mercedes-Benz, travelling against the flow of traffic, slammed into the front of their car. Mr Liong's car veered left and landed on its side, near the road shoulder, trapping him inside. He was pronounced dead at the scene when paramedics arrived while Ms Oliver suffered injuries to her jaw, right shoulder and lower body. Mr Liong's younger brother had previously told The Straits Times that she was in no condition to speak, and many questions about the accident remained unanswered. The 53-year-old driver of the Mercedes-Benz, Lim Chai Heng, was also injured and warded at the National University Hospital, where he was charged the following day with causing death by reckless or dangerous driving. An accident on the Ayer Rajah Expressway (AYE) on Monday (Dec 19) morning left one dead and three others injured. The accident occurred at about 8am. According to an eye-witness, the accident that left a trail of destruction on the expressway was caused by a driver of a Mercedes who allegedly drove 120km against the flow of traffic. In the videos, a severely damaged silver-coloured car can be seen next to a wall of the AYE. The car's bonnet was completely smashed. A few metres away, there was a fallen motorcycle beside a stationary car surrounded by debris. A woman who looked to be conscious was lying in front of the motorcycle. The SCDF said that it was alerted to the accident at about 8.05am. SCDF personnel attending to a black-coloured car that was also involved in the accident. A male Chinese was found trapped in the driver's seat of a car and he was extricated by SCDF using hydralic rescue tools. He was pronounced dead by paramedics. Three persons were conveyed to NUH. Two contributors sent videos of the accident to citizen journalism website Stomp. A motorcyclist and his pillion rider, both of whom are Malaysians and aged 34, were also hospitalised for their injuries. Administrative officer Janice Choo, who was riding pillion, was flung from the bike when Lim's vehicle hit it. She and Mr Teh Tze Yong, who works as a driver, were warded at the National University Hospital. But they did not see each other until Thursday. The other people involved in the accident were not hospitalised. This article was first published on December 23, 2016.